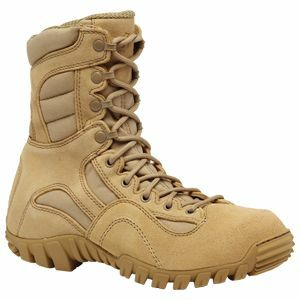 The Tactical Research TR350 Men's Khyber II Hot Weather Lightweight Mountain Hybrid Boot is the replacement boot for the ever popular TR360 and adds U.S. Army uniform compliance with AR-670-1. The TR350 removes the heel kicker a small fabric area on the toe for U.S. Army compliance. This boot features a low profile footprint for missions that require agility and balance that can't be had with a traditionally sized military boot. This boot features top quality cowhide suede and dual cooling vents to keep your feet dry. The aggressively designed Khyber outsole provides outstanding grip on all surfaces with both small and large lugs to help you tackle all terrain. Belleville's patented TR-1 insole focuses on arch and heel support through a firmly padded polyurethane design.